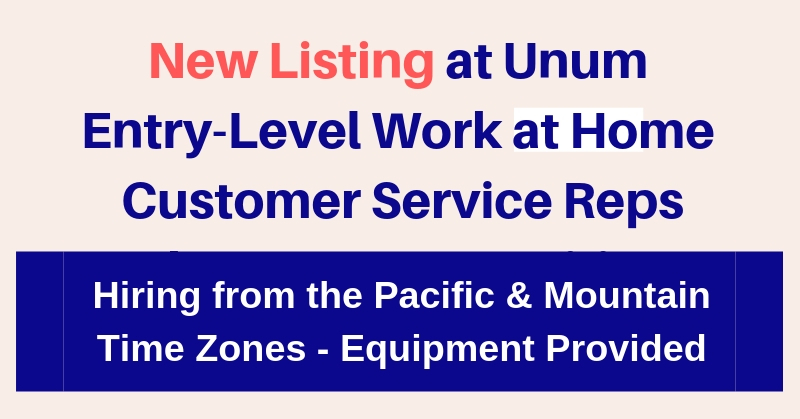 If you’d like to work from home for a larger, established company with benefits, the insurance giant Unum is looking for more f/t Customer Service Specialists who live in the Pacific or Mountain time zone. The company PROVIDES EQUIPMENT and BUSINESS CLASS INTERNET. Benefits from day one. Looking for a company where you can make an impact? As a Customer Service Representative I, you will be the first point of contact for our inbound customers calls and a direct representation of our brand. You will have the rewarding job of creating exceptional customer experiences; ensure information is accurate; and operate with empathy and integrity. This entry-level role provides a strong foothold into an organization and company with multiple career paths and the environment to be your best you here. Respond to customer inquiries with timely and accurate information. Ability to work a regular assigned shift between the hours of 8am-8pm Eastern, Monday through Friday (no shifts end after 8pm and no required weekends). Follow all documented processes/workflow to enhance customer service and reduce customer effort/operating efficiency. Utilize resources and tools to accurately respond to customer inquiries. Ensure privacy of our customers remains the utmost importance. Meet the expectations of the quality/productivity standards. Demonstrate a passion for the values outlined in the We are Unum value statements. Successful completion of Contact Center training program, including demonstrating on phone proficiency and passing required knowledge checks. Attendance in accordance with Contact Center attendance guidelines. Customer Service Representative I must successfully complete the Contact Center training program and demonstrate basic proficiency in servicing inbound phone calls after training. Demonstrated customer service experience and/or experience in a customer service-oriented environment. Strong customer service orientation with demonstrated commitment to meet/exceed customer needs. Ability to maintain reliable and predictable attendance. Demonstrated ability to work in a fast paced, structured environment, handling large call volumes. Self-directed with the ability to perform both as part of team and individually. Ability to adapt and work effectively in a continuously changing environment. Consistently demonstrate a high level of professionalism through a strong work ethic that positively influences the work habits of the team. Detail oriented with a focus on quality and consistently meeting goals. To go to the jobs, click here. Then click on “View Open Positions,” then search with keyword “remote” without quotes. For more jobs like these, check our Newest Jobs & Gigs page. To be the first to hear about jobs like these, like our Facebook page. Good luck in your next steps toward working from home!